Anytime you can come out of a road trip with as many wins as losses, that's a good road trip. When you can seal up such a record by beating a perennial playoff contender and one of the top teams in the league, that's even better. For Texas, that was the story of the day. A complete effort for the Stars put them over the Ads this afternoon in Wisconsin. A 2/4 effort on the power play, flawless PK, and solid and confident goaltending added up to a 5-3 victory. Ray Sawada collected three points in the game while Philip Larsen and Matt Fraser each had two. Milwaukee jumped out to an early lead with a goal by Ryan Ellis, who snapped a pretty wrister from the circle to make it 1-0. Texas fought back on the power play with Ray Sawada collecting his third goal of the year with assists from Jordie Benn and Richard Bachman, his second assist of the year. Mark Van Guilder beat the Texas defense and goaltending with a sniper shot to make it 2-1 with 57 seconds left in the period. Milwaukee outshot Texas in the period 9-7. Matt Fraser put the Stars on the board early in the second period to tie things at two. Sawada assisted for his second point of the night. Texas grabbed the lead on the power play with Travis Morin's 3rd goal of the year, assisted by Larsen and Fraser, to make it 3-2 just 4:14 into the period. The Ads' Zach Stortini took exception and scored his first of the year just last the 7 minute mark to knot things at three. The Stars would outshoot the Ads in the period, 15-9, but the teams would be tied after 40. The third period was all Texas. With time winding down in the period, Ryan Garbutt slipped into the zone and backhand passed the puck to Tomas Vincour, who rifled it from the blue line to beat Jeremy Smith and take the lead at 4-3. The Stars held on in the last four minutes to keep Milwaukee from netting another. Francis Wathier added an empty net goal with just under a minute left, assisted by Larsen and Sawada, to make it a 5-3 final. Texas handed Milwaukee's Jeremy Smith his first regulation loss (4-1-1) with the 5-3 victory. The Stars are now one game under .500 with the Toronto Marlies coming to town on Thursday. The last time the Texas Stars faced the Milwaukee Admirals, the game ended with a handshake line as the Ads advance to play the Houston Aeros in the West Division final in last year's playoffs. Texas, on the other hand, took a longer than desired summer break. The Ads are flying high once again in the early going this season. They may not have the most points, but they possess the best points percentage in the entire league. They've reloaded the gun with the always stout Predators prospect system continuing to produce. Additionally, Milwaukee picked up former Dallas Star Kirk Muller from the Canadiens organization to coach the club. Texas Stars faithful will surely remember Chris Mueller and Gabriel Bourque for their awesome efforts in last year's playoffs; both are back for another season. Mark Dekanich departed for a one-way deal with Columbus but Jeremy Smith is still the goalie in residence for the Ads. He is 4-0-1 with a 1.36 GAA and .947SV%. Atte Engren, who was a late season callup for the Ads last year, is 1-1 with a 3.05 GAA and .889 SV%. Engren started last night's loss to the Griffins, so I would expect Smith. The elephant in the room for the Texas Stars is their prolonged stint of below .500 hockey. After clawing back to even with back-to-back wins in last week, Texas is now two below .500 and in 30th place in the league. As I've pointed out before, the goalie stats are incredibly uncharacteristic for both of these goaltenders (or any professional goalie for that matter). Both are at greater than 3.3 GAA and less than .890 SV%. I've said it's not sustainable, but how does it get fixed? Texas seems to be giving up better chances to their opposition and giving less help to their goaltenders down low. It has to change for Texas. Unlike in the NHL, there's no draft pick "reward" for finishing last in the league. You just get a sour taste in your mouth and long frustrating summer. It's early, but the final goal has to be in mind, even in October. To say the Stars and Wolves played a very tight game this evening would be an understatement. Only 14 total penalty minutes were doled out in the contest and both goaltenders had sparkling saves left and right. Ultimately, the third period was the time for action for both teams with all 3 goals being scored in that period. In the end, Texas fell to Chicago by a 2-1 margin. Neither Texas nor Chicago could break through in the first period, despite first period power play opportunities for both teams. The Stars finished the period ahead on the shot count 13-7. The second period was similarly tight until the last minute. Each team had a fruitless power play chance. It was Darren Haydar breaking open the scoring in the last minute of the second on a nice transition play. After Texas had just had a few chances of their own, the Wolves turned the play back and beat Tyler Beskorowany to make it 1-0. Haydar added another for the Wolves, scoring in the third period to make it 2-0 right off an offensive zone faceoff. Tomas Vincour put one in the Stars' score column almost immediately after with a sniper shot from the right wing circle to set things at 2-1. Texas would try for the equalizer with the empty net, but the goal wouldn't come. As previously tweeted, the Stars released Tyler Arnason from his PTO this afternoon. In seven games, he never saw better than third lines minutes and scored only one goal. Texas continues its tour of the Midwest Division with a stop this evening in Rosemont, IL, to visit the Chicago Wolves. The Wolves have had a few changes of their own over the summer, most notably an affiliation change. With the move of Atlanta to Winnipeg, the Wolves were picked up by the Vancouver Canucks as their primary affiliate. Some of the names from the Wolves roster are the same, such as Haydar , but you'll recognize most as coming from last year's Moose roster. The Wolves are also mired in some early season difficulty, tied with the Stars in points at just six. They fell last night to Milwaukee at home 2-1 in a hard fought tight game. Their goalie, former Texas Star Matt Climie, received third star in the losing effort. Also in nets for Chicago is Eddie Lack, last year's outstanding rookie netminder from Manitoba. The two have almost identical stats. Climie is 2.36 GAA and .942 SV%, and Lack is 2.33 and .926. The Stars would like nothing more than to continue their success from last season against the Wolves. In six meetings last season, Texas emerged victorious in every one, including a record setting 8-2 win. The Stars will face Chicago four times this season. Once again for Texas, we're looking and a Jekyll and Hyde situation on special teams. The Stars lead the league in PP%, bumping that number to 38.5% with a 2/6 effort on Thursday. However, they are second to last on the PK at 71.4% and, to make matters worse, taking far more penalties than in previous years (#11 in the league at 20.14). It's a bad combination, especially when 5-on-5 scoring is touchy at best. It's a long season, but playoff teams do not have this kind of disparity between the three modes of play. It has to be rectified. 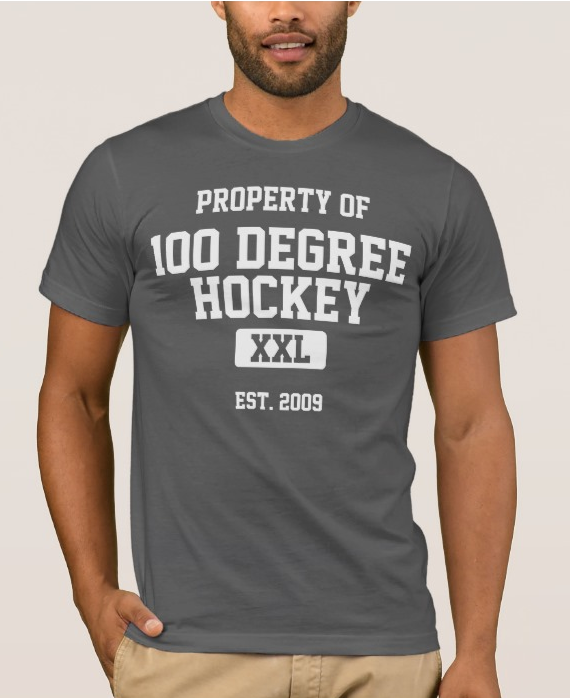 While Texas makes its way to Chicago and surely searches out a good place to watch tonight's Game 7 between the Rangers and Cardinals, some attention has been drawn today to the plight of west coast based NHL teams calling up players from the minors. TSN's Darren Dreger wrote in an article published yesterday that "several NHL western conference teams (incl. Los Angeles, Anaheim, San Jose, Phoenix, Colorado, Vancouver, Edmonton and Calgary) are involved in ongoing discussions to improve the geographic challenges some teams face in trying to develop their players from afar." While most of the teams in that group are OK with their current affiliations and were simply looking for more travel days or better travel schedules, some advocate a more extreme approach, "the possibility of creating an entirely new league primarily based to serve some of the NHL's pacific and northwest division." For teams like the Ducks (Syracuse, NY); Kings (Manchester, NH); and Sharks (Worcester, MA) this makes fantastic sense. For Dallas, a callup means jumping in the car and driving 3 hours to Dallas if you've got that kind of time. If not, jump on a Southwest flight to Dallas Love Field and you're good. For these other teams, you'd better have 24 hour notice. Moving some teams out West makes some degree of sense. But then again, it doesn't. The first choice of who to move would probably be the lowest performing teams in attendance. Some of these teams are the longest tenured in the league, including Springfield, Rochester and Binghamton, who won a championship last year no less. Dave Andrews would be very hesitant to make a move for any of these franchises. Additionally, when you move teams out west, you introduce those two dirty words: "travel expenses". Every trip goes from a bus to a plane and that racks up pretty quickly. Or does it? 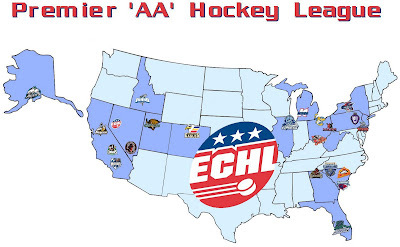 The ECHL is doing just fine and it's as spread out as can be. Granted, the Eastern Conference never plays the Western Conference during the regular season as a travel expense compromise. That's already the case for many West teams including Texas. Look at this map (click to zoom) and tell me why it's not possible for travel expenses to be overcome at the AAA level when the AA level can do this: I applaud the NHL clubs for having the exploratory meeting and would be intersted in hearing AHL Commissioner Dave Andrews' response to news of the meetings, but I have a sinking feeling that nothing will get done along these lines in the foreseeable future. Overall, Texas played a good game tonight. The Stars were down after 20 minutes and rallied back to tie it in the second and make a game of it. It was a good showing of how the team is coming together to work as a unit and not get frustrated by being down. In the end, however, Texas fell to Peoria 5-3 with the last goal coming on an empty net. Brent Sonne opened the scoring for the Rivermen in the first period, catching Richard Bachman out of position on a rebound to make it 1-0. Brett Sterling then put the Rivs up 2-0 with a nice play from behind the net to snipe a goal from the right wing circle. The period ended with the score at 2-0 and a 16-8 shot advantage for the Rivs. Texas gave up another goal just 47 seconds into the second period to set the score at 3-0. The goal was scored as Bachman was scrambling in front of the net and the net came off its moorings. The power play goal counted anyway for Derek Nesbitt. For the rest of the second, however, it was the Stars' power play that came alive. Just past the halfway mark of the period, Tomas Vincour put home a fat rebound off Ben Bishop. All three Texas forwards were buzzing the net on the play; the goal was just inevitable. Jordie Benn scored off a point shot just over two minutes later to make it 3-2 with a team-leading 11th assist for Travis Morin. And the Stars completed the comeback with a power play goal just before the final buzzer by Matt Fraser, his 7th of the year. Ray Sawada and Dan Spang assisted on the tally, that was officially marked at 19:59 of the second. Texas put the pressure on the Rivs in the period, outshooting them 19-8 in the period and 27-24 after two. If the second period was the Stars', the third was owned by the Rivs. Brent Sterling scored the go-ahead goal just past the halfway point of the third. Coming out of the box, he received a drop pass from Stefan Della Rovere and snapped it to the top of the net to beat Bachman. Peoria sealed things up in the final minute of the game with an ENG. Texas and Peoria face off again for the second time in five days after the Stars claimed the first game in overtime 6-5 last Saturday. Both teams played one game in the interim, both wins for the two clubs. Texas, of course, dropped six on the IceHogs in Rockford while the Peoria hosted the Wolves and won 5-2 on Sunday. The big story of the Stars in Rockford was the synergy of the newly created line of Vincour-Tousignant-Garbutt. That line combined for six points in the contest. Added to the lineup of Fraser-Morin-Sawada, which notched seven points in Rockford, Coach Pyle has the potential to roll those two lines as his top six. This team is starting to live up to the way it was billed after having some trouble out of the gate. With so many new parts, including the new coaching staff, Texas was struggling to find the right combinations and pairings. Two are potentially lined up; two more to finely hone. The third and fourth lines are nothing to shrug at either with Wathier-Arnason-Godard and Gazdic-Glennie-Sceviour providing a little bit of scoring punch and a little bit of actual punches. It's just a question of putting the right people together. Peoria also reworked their lineup in their last game, adding Anthony Nigro to an existing line of Adam Cracknell and Jonathan Cheechoo. Nigro scored a goal and Cracknell and Cheechoo each had a goal and an assist. "Nigro was awesome on that line Sunday," Rivermen head coach Jared Bednar told the Peoria Journal Star. "It's an experiment we're going to pursue. He didn't have the numbers on the scoresheet that the other two guys had, but he did a lot of legwork and made things happen on that line." The final item, of course, is the Stars and Rivs' unpleasantries after the whistle on Saturday. Conflicting reports have indicated that there was either a bite, an attempted bite, or spitting involved in the incident. Stefan Della Rovere, the alleged biter/spitter, sat out Sunday's game with a required one game suspension for incurring a match penalty. "I don't know what happened with those guys or whether there is any carryover from it, but I'm not expecting anything," Coach Bednar told the Journal-Star. I wouldn't expect anything either in a tight game, but if things get to wider margin leads, watch out. It was a game for the grinders as Coach Pyle shuffled lines and found a nice combo in Tomas Vincour, Ryan Garbutt and Mathieu Tousignant. That line scored two goals in the game and the established Fraser-Sawada-Morin line added a third and fourth, both on the power play off the stick of Matt Fraser. Luke Gazdic added his third goal of the year and Larsen scored on the power play in the dying minutes of the third as Texas emphatically got back to .500 on the season. The Stars opened the scoring in the first period with Ryan Garbutt's first goal of the year. The rebound tally was assisted by his linemates, Vincour and Tousignant, at the 5:43 mark of the game. Texas continued their difficulties on the penalty kill this season in the period, allowing Rockford's first goal just four seconds into a minor to Travis Morin for tripping. Shawn Lalonde notched his first of the year at 17:55 with assists from Kyle Beach and Brandon Pirri right off the faceoff. Tomas Vincour's line got after it again 31 seconds later, however, scoring their second of the night. Mathieu Tousignant notched his first of the year with assists from Vincour and Garbutt to answer the power play tally from Rockford. The period ended with shots to Texas's advantage at 11-10. The Stars killed two penalties in the middle frame and earned two of their own, scoring on the second. Once again, it was Matt Fraser from the right wing circle beating Alec Richards. Linemates Travis Morin and Ray Sawada assisted on the goal that set the score at 3-1. Texas would go to the room with Rockford leading the shots at 26-13. The Stars only managed three shots in the period and scored on one of them. Rockford was getting similarly outshot in the third period, 12-5, when Ben Smith camped out in the crease and redirected a Kyle Beach shot past Tyler Beskorowany to set the game at 3-2. Texas got back on the power play again and it was the starting line getting another PPG for Coach Pyle's club. Matt Fraser scored his second of the night and team-leading 6th goal overall to put the Stars back at a two goal lead. In the dying minutes of the third period, Luke Gazdic notched his third of the year with a quick reaction play to steal the puck from an IceHog and score an unassisted tally to make it 5-2. The Stars finished the game on the power play, scoring one more for good measure off the stick of Philip Larsen on a nice tic-tac-toe play to finish things up at 6-2. The Morin-Sawada-Fraser line had seven points in the game. The line of Tousignant-Garbutt-Vincour had six to their name. The Stars will be back in action at Peoria on Thursday. Texas lost Maxime Fortunus early in the game on a hit by Philippe Paradis. He did not return in the game. Travis Morin left the game in the second period, the reason for which was unclear, but he did return to the contest before the end of the period. Eric Godard had his first fight of the year this evening against Brandon Bollig. Bollig couldn't get a punch in edgewise as the Stars forward leveled Bollig with devastating blows. Bollig went to the box with a cut above his eye. So far, it's been a rough season for the Texas Stars (2-3-0-0, 4 pts, #15 Western). It's not going to get much easier as the Stars head out on the road for their first extended road trip of the season. There were positive signs of life in the Stars' games this weekend, however, which they split down the middle. The Stars dropped their Thursday evening game against San Antonio (Florida Panthers) in heartbreaking fashion 4-3, but earned the full two points in an overtime victory against the Peoria Rivermen (St. Louis Blues) on Saturday night. Texas takes to the road for their first true road trip of the season, a four game stint that begins tonight in Rockford. The IceHogs are only one win ahead of the Stars at 3-3-0-0, but early in the season, two points means five places in the standings. The Stars have traditionally done well against the IceHogs, 9-5-0-0 in two years not including a 4-0 sweep in the 2010 Calder Cup Playoffs. At the BMO Harris Bank Center, formerly the MetroCentre, the Stars are 5-2-0-0 all-time. With Rockford's move to the newly created Midwest Division, the Stars will only face the Blackhawks' farm club four times this season. The balance of things needs to change up for the Stars early in the season going. All it takes is one look at the goaltending stats to know that this is not the Texas Stars team we saw the last two years. Richard Bachman is the better of the two goalies with a 4.20 GAA and .854 SV%. Beskorowany is at 6.94 GAA and .750 SV%. Those numbers are not the kinds of numbers you should see out of two quality professional netminders like Bachman and Beskorowany. History on both of them shows that they will improve. The typical minimum acceptable level for save percentage is .900 for a professional. Both players should surface toward those levels as the season progresses. As of today, Texas leads the league in power play percentage at 35.7%, topping Worcester and Hershey. Unfortunately, Hershey and Worcester also factor in the top five of penalty kill percentage. Texas is seconds to last at 70.4%. Regardless of how high the PP% goes, the PK% is unsustainably low. Power play goals against are back breakers and momentum changers. They put the team in a bad spot mentally and change the feel of the game for the fans (home fans will get quiet, away fans will get rowdy). That number has to improve. For Rockford, some familiar faces lead the way. Returning Hogs Connelly (0-6-6) and Klinkhammer (2-3-5) lead the scoring while former Stars Brandon Segal leads goal scoring with four goals and no assists. Alec Richards returns to the net for Rockford this season, currently sporting a 2.77 GAA and .915 SV%, earning a 3-1-0 mark in 4 games. Alexander Salak, who was once thought to be slotted for the backup role in Chicago, has started two games and taken the loss in both, earning a 2.53 GAA and .891 SV%. The Stars announced today at they have sent two players down to Idaho, defenseman Hubert Labrie and forward Ondrej Roman. Labrie's assignment was expected by many as he had not gotten into any games this season and was the 8th man on the roster with Philip Larsen's assignment from Dallas. It does the young blue liner no good to be sitting in the press box when he can be getting ice time in Boise. This assignment makes sense. Ondrej Roman has had a rough fall this season. Roman was thrice a healthy scratch. He has played on the fourth line this season in his two games and recorded no statistics and only two shots in the games. This is not a death knell for Roman, but it certainly doesn't feel good. He is not getting ice here, so he might as well get some in Idaho. Other popular Texas Stars who got some seasoning in Boise after time with Texas include Luke Gazdic and Mathieu Tousignant. They've both turned out just fine. Time will tell how this sets up Roman's career trajectory. The Texas Stars announced on Monday the team has assigned forward Ondrej Roman and defenseman Hubert Labrie to the Idaho Steelheads, Texas’ ECHL affiliate. The 22-year old Roman is in his second full season after playing in 72 games with Texas last year. 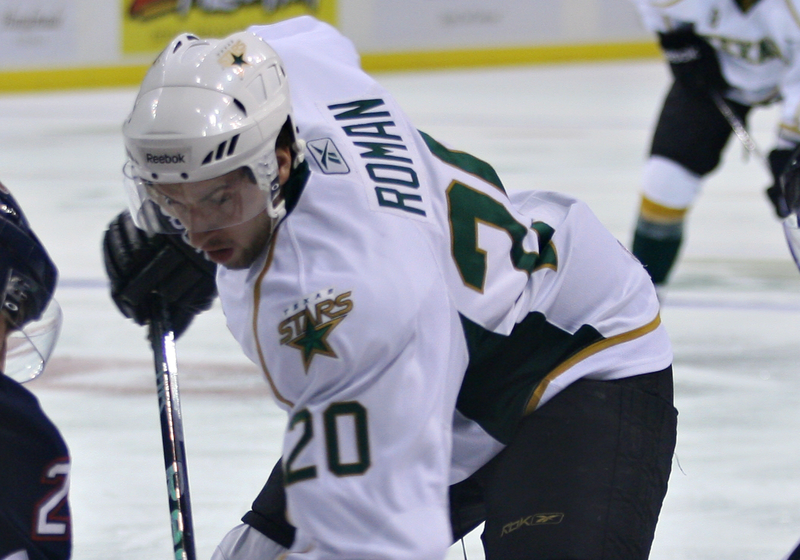 As a rookie, Roman scored eight goals and set up 14 for a total of 22 points. The Ostrava-Prouba, Czech Republic native is scoreless in two appearances for the Stars this season. Dallas drafted Roman in the fifth round (#136 overall) in the 2007 NHL Entry Draft. Labrie turns pro after playing the last four years in Gatineau of the QMJHL from 2007-08. In 192 QMJHL games, the 21-year old defenseman scored ten goals and set up 38 others for a total of 48 points. 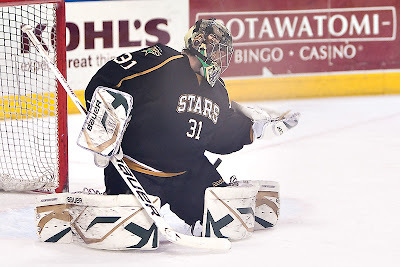 Labrie participated in training camp with the Dallas Stars and Texas Stars. Both Peoria and Texas came into tonight's game hungry for two points and it would take more than the usual 60 for one of them to emerge with those two. 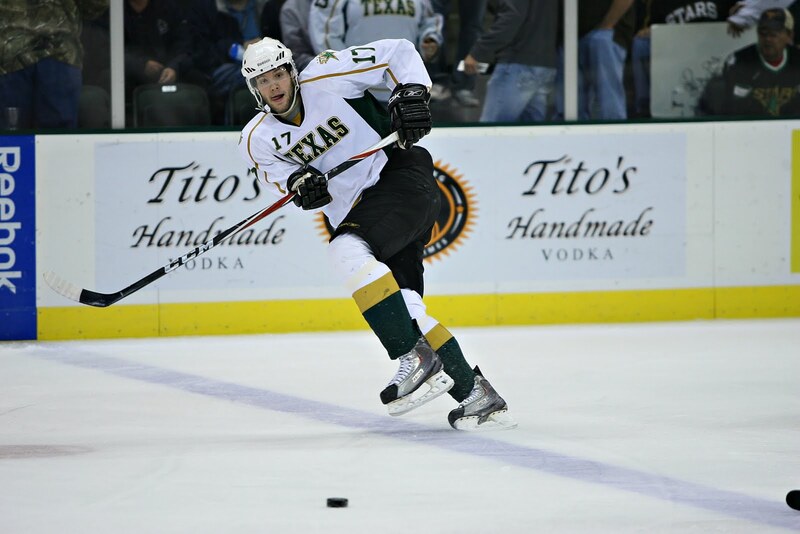 Texas finished a frenetic night in Cedar Park with an overtime win 6-5 against the Rivermen. "The biggest thing is getting the two points," said Matt Fraser, who scored the game winner. "It's good to put one back in the win column." Texas started things out early in the first period just 34 seconds in. Travis Morin collected his second of the season, assisted by Fraser and Lukowich, on a nice play from behind the net by Fraser. Mark Cundari of Peoria answered just two minutes later to make it 1-1. Texas had the next two off the sticks of Sawada and Gazdic. Sawada's deflection was assisted by Morin and Larsen on the power play. Luke Gazdic's tally was a case of being in the right place at the right time to accept a pass from Brad Lukowich in the left wing circle. The Stars then unraveled a bit. Peoria got on the power play off a few unnecessary penalties by Texas. "We have to learn not to take those stupid penalties because you'll get them going," said Coach Pyle. And get going they did. Peoria scored the next two on the power play to tie things at three. Still in the first period, Phil McRae put Peoria up 4-3 with his second of the night. Matt Fraser collected his second point of the night with the fourth Stars goal of the night, another behind the net play. On the night, the Sawada-Morin-Fraser line combined for nine points total. Dan Spang collected his second goal of the year in the second period on yet another power play goal in the game. Spang skated in along from the center red line and beat Bishop clean over his left side to make it 5-4. In the third period, Texas battled as much with the Rivermen as they did with the referees. A long 5-on-3 gave Peoria another power play goal, notching a hat trick for Phil McRae, and tying the game at five. The game would go to overtime and which line but the starting line to make the game winner. Texas got on the power play in the overtime and stayed true to their nature, scoring a blast from the right wing circle off the stick of Matt Fraser. Travis Morin assisted and collected his 4th point of the game. Texas now heads out on the road for a four game stretch. Coach Pyle intoned that discipline is even more important on the road, "We need to be more committed to learn how to play with a lead and play a game that we can win." After the final buzzer, the Stars and Rivermen engaged in a scrum at center ice. Stefan Della Rovere took a swing at a Star, which later earned him an intent to injure match penalty. Stars players Gazdic and Fraser earned game misconducts for continuing an altercation after the refs had intervened. Given the nature and timing of the incident, it could be reasonable for Stefan Della Rovere to expect a call from the league office in the morning. The Texas Stars take the ice this evening against a similarly challenged Peoria Rivermen in the early season. The Rivermen, who have always been a good rivalry for the Stars over the past two years, come into the CPC this evening having only just secured their first win last night over the San Antonio Rampage. The Stars and Rivs have identical records with the exception of an additional shootout loss for Peoria. It might be an understatement to say this is a big game. If Texas wins tonight, it avoids tying the franchise record for losses and sets itself up to be on the upswing as they head out on the road for four games that will take them into the month of November. The Rivermen come to town featuring a strong power play (#8 at 25%) and a stifling penalty kill (#4 at 90.3%). While Texas's power play is better (#5 at 29.2%), the penalty kill is one of the worst in the league (#25 at 75%). Brett Sterling and TJ Hensick lead the Rivermen on offense and some familiar faces return in net. Jake Allen and Ben Bishop are the goaltending duo for Peoria once again this season. Allen is 0-1-1 with a 2.89 GAA and .905SV%. Bishop has the Rivs' only win at 1-2-0, a 2.35 GAA and .925SV%. JOnathan Cheechoo is also a player to kep your eye on, once a winner of the NHL's Rocket Richard Trophy. Texas's defense leads the way on offense so far this season, which may not be a positive sign. Dan Spang (1-4-5) and Brenden Dillon (1-3-4) lead the team in points. Travis Morin is tied with Dillon at four. Every player on the Stars roster except one, Stephen Schultz, is even or minus in the plus/minus column. The Stars know that this is a big game, and not just because of the uniforms they will be wearing. Brenden Dillon tweeted out earlier this morning, "Big game tonight for the boys! Pink in the Rink at home no better time to get back in the Win column!" Indeed. Despite the Stars' best efforts in the third, the San Antonio Rampage slipped by Texas in the final few minutes of tonight's contest to drop the Stars to 1-3-0-0 on the season. The Stars showed a better team character than in previous losses, coming back from an early deficit to tie the game in the final period. "Sometimes you'll get down in a game and you have to come back and that's a playoff type situation," said Maxime Fortunus. Texas got on the board first with a power play goal from Tomas Vincour, recently sent down from Dallas. Jordie Benn and Colton Sceviour assisted on the tally, scored on the far side from the left wing circle. Only eighteen seconds later, Scott Timmins scored an unassisted goal with the puck taking a weird bounce off the end boards and catching Bachman out of the net trying to stop it. The combination of weak backchecking from Texas and strong forechecking from San Antonio meant Timmins was the first to the puck, putting it over Bachman easily. Texas finished the period ahead in shot count 13-6. San Antonio owned the second period, scoring two. Repik was up first with a power play goal with Luke Gazdic in the box for slashing. Former Star Greg Rallo scored the second, also on the power play, to put San Antonio up 3-1. The third goal was another strange play in front of the net, where Texas seemed to be too casual on the penalty kill. "We got a little sloppy at times," said Coach Pyle. "We've got to have urgency from the get-go. We made mistakes that you cannot make." Texas came alive in the third period, tying up the game before ceding the game winner in the last few minutes. "I liked the effort of the guys coming back," said Fortunus. "We needed to put a little more pressure on them, on their D men." Vincour scored his second of the night just 72 seconds into the period. He collected his own rebound for the 3-2 mark. Travis Morin scored four minutes later on a redirected Fortunus shot for his first of the year and to tie it at three. The crowd was back in it and so were the Stars. Texas outshot San Antonio in every period and overall at 39-19. The final goal came with only 108 seconds left in the game. Texas had just been guilty of an icing infraction, and Coach Pyle called his timeout to give his skaters a chance to rest their legs. After a faceoff win, Scott Timmins got his second goal of the night and third of the year, ringing one off the post to make it 4-3. The Stars tried to mount a comeback but couldn't put it together. The Stars take the ice again on Saturday against Peoria. Scott Glennie played in his first game of the season tonight. Ondrej Roman was scratched to make room for him. The Stars take the ice this evening in Cedar Park coming off a game that was memorable for all the wrong reasons. In Oklahoma City, Texas got railroaded with a 10 goal burst from the Barons. One of the only good things you can say is at least no one got hurt in such a meaningless second and third period. With the loss, Texas has set its record at below .500 for only the second time in franchise history. The only other occurrence was after Texas's inaugural loss in San Antonio in 2009. While Texas faced San Antonio twice in the preseason, this team is not the same as that one. 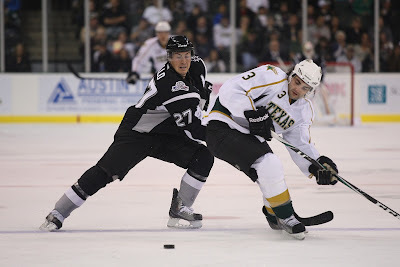 Brian Foster has played in all three games for the San Antonio Rampage, winning two in a shootout and losing the other in regulation. He is 2-1 overall with a .900SV% and 2.48 GAA. Manny Legace did start the Rampage's first game, but was taken out after getting injured in the first. He has since been released and signed by Springfield. Tyler Plante has backed up Foster since then. Bracken Kearns stayed with the team despite the move and is leading the scoring early with 3 goals. Three players are tied at one. Former Star Greg Rallo has yet to score on the young season but has played in all three games and collected a plus-3 rating with 11 shots on goal. He told Dan Weiss that he's expecting a mix of cheers and boos when he returns to the CPC this season. San Antonio will come to town rested, as they have not played since an 11-round shootout win against Houston on Saturday. On the Texas side of the ledger, I would expect that Coach Pyle worked hard this week on 5-on-5 play, as he said he would do last week. After a loss like the Stars suffered, there isn't a lot to do but re-rack and try again. Despite a lack of history on this team, looking up and down the roster would suggest that this team is not typified by that sort of play. It's not time to panic yet. The stat about better than .500 play that this franchise has enjoyed is telling of what its fans will expect. Remember that even championship teams go through rough patches. Some happen early and some happen late. This may just be one of those patches. Starting this evening, I'll be appearing regularly on the radio in Boise to discuss the Texas Stars with the Idaho Steelheads broadcasters and fans. They are huge fans of some of their former players who now suit up for the Stars, including Bachman, Beskorowany and Tousignant. I will appear on this evening's program at 6:30 Mountain/7:30 Central on AM 1350 in Boise. You can listen online by following this link and then selecting the Idaho Steelheads logo. This was not a good week for the Texas Stars (1-2-0-0, 2 pts, #11 Western). After putting up seven goals on the Oklahoma City Barons (Edmonton Oilers) in their season opener, Texas dropped two games by a total score of 15-3 to the Houston Aeros (Minnesota Wild) and those same Barons. Despite that bit of disappointment, it's early in the season. As any good hockey coach would say, "it's just one game". After last week's shellacking, Oklahoma City was mad. They did not forget that 7-0 score and wanted to do one better on Texas tonight. The Stars had their worst defensive performance in franchise history, allowing 10 goals on the night. Tyler Beskorowany, who started the game, was pulled after four against. Richard Bachman let in just as many and Beskorowany was put back in net for the third period. Texas allowed its first power play goal (3 total) in the game as well, while putting nothing in on the man advantage themselves. For the Barons, scoring came in bunches. Tremblay, Keller and Grant scored the Barons first three goals in just 87 seconds starting at the 11:53 mark of the first. Texas held its own in the period aside from that minute and a half. Tyler Beskorowany was pulled when Ryan Keller collected his second of the night at the 3:12 mark of the second period. Another bunch of scoring came at the 7 minute mark of the second for OKC. Cornet, Vandevelde, Pitlick and Hartikainen scored four goals in four minutes, including three power play goals. Colton Teubert added a ninth goal with just under two minutes left in the second. Francis Wathier had the Stars' only goal on the night in the third period, assisted by Spang and Lukowich. The 8 goal deficit wouldn't last long as Tristan Grant notched his second of the game to make it 10-1. Having not seen the game in person or on video, it is difficult to say where things went wrong for the Stars. However, when the score is 10-1, it's often easier to highlight the things that went well. The only positives I can see in the game are Brad Lukowich's astounding even plus-minus despite the score and Texas's shot advantage in the third period. Otherwise, it's a game the players would rather forget and the coaches will make sure they never do. The Stars set (at least) three defensive records in the loss: goals against total (10), goals against in a period (6), and margin of defeat (9). Both the Texas Stars and Oklahoma City Barons traveled overnight last night to arrive in OKC for tonight's contest at the Cox Convention Center. Texas fell to the Houston Aeros while Oklahoma City collected their season's first win against fellow West Division rival San Antonio 3-2. Both Texas and OKC are now 1-1 on the young season. After blanking the Barons last weekend, Texas had a five spot dropped on them by the unbeaten Aeros last night. The Barons scored their first three goals of the season off the sticks of Ryan O'Marra, Josh Green and Colton Teubert. Mark Arcobello had two assists, including one on the game winner. David LeNeveu got the start and stopped 32 of 34 shots against. It is almost a good thing for the Stars that OKC won last night. With at least one win under their belt, the Barons are less likely to be fixated on the 7-0 shellacking they received in Cedar Park last week, but only slightly. The Stars will do well to make sure they don't get lured into post-whistle extracurriculars or bad penalties by the Barons. "On the road, you've got to play smart," said Coach Pyle after last night's game. "You've got to stay out of the box and take advantage of your opportunities." Coach Pyle also pointed out something that could become an unfortunate storyline for Texas if the team doesn't jump on it early. Of the Stars' nine goals on the season, six have come on the power play. It's early, but does Texas have a solid gameplan 5-on-5? "We've got to play a little better 5-on-5 and create a little bit more offense from that," said Pyle. Coach Pyle also indicated that Philip Larsen should be inserted into the lineup tonight. Chances are that Jace Coyle will be taken out of the lineup for Larsen. After winning in dominate fashion on Sunday, the Stars met an old friend, the Houston Aeros, with not so favorable results on Friday night in Cedar Park. An good effort by Texas was spoiled by a few defensive missteps that Houston managed to capitalize on. 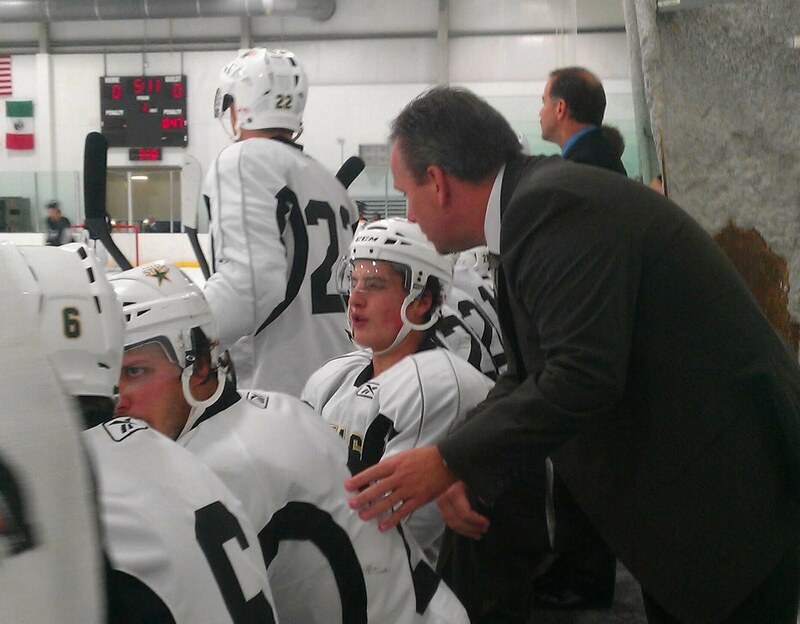 "You've got to make sure you take care of the puck against a team like that," said Coach Pyle. "Because when they get opportunities, they're going to score." Texas laid claim to the first tally of the night with Brenden Dillon's first professional goal. Ray Sawada made a nifty play behind the net to get the puck out to Dillon, who buried it for the 1-0 lead. Texas center Travis Morin collected the second assist on the play, claiming the Texas Stars all-time lead for points scored. "I came here a couple of years ago not knowing what to expect," said Morin. "Obviously, it's been great for me. All those dreams and aspirations have come true." Houston got it back just as quickly with a great individual effort from David McIntyre, beating Bachman for the first time this season to make it 1-1 to end the first. The Aeros took the lead in the second with an unassisted goal from former Star Warren Peters. Texas defenseman Dan Spang whiffed on a D-to-D pass to partner Jordie Benn. Peters, already hard on the forecheck, broke in unabated and scored. Ray Sawada got his second point of the night with a goal shortly thereafter working garbage collection in front of the net on the power play. The goal would be the last of the night for Texas, however. Morin and Spang collected assists on the tally. Casey Wellman provided the game winner as Texas was caught not paying attention in their own zone, concerned for the health of Luke Gazdic, who was down after an uncalled knee on knee hit. Wellman found the puck backdoor for the 3rd and game winning goal. David McIntyre would add a fourth, his second of the night, and Ortmeyer would seal the deal with an empty netter. While the power play is clicking along at 6/15 on the young season, Coach Pyle felt that things needed to improve more still after two long 5-on-3s went by without a goal. "We could have taken more control [with the power play] and were undisciplined at times," said Pyle. "And that's my fault. I'm the guy that needs to make sure the guys understand the discipline part of it." The Stars need to make sure they are discplined tomorrow in OKC as Texas will be tired from an overnight bus ride and game the night before and will be in no shape for extended PK time. UPDATE: Philip Larsen has been assigned, but it is unclear at this point if he will play in tonight's game. Coming off four days of rest, the Stars are facing off against the Houston Aeros tonight in just the second game for either team. Last season, the Houston Aeros took a trip to the Calder Cup Finals, just as Texas did the year before, also losing to the Eastern Conference. Regardless of the loss, the Aeros are still the reigning Western Conference champion. Texas had its way with Houston in the first season but in the second the reverse was true. The Stars' overall record against the Aeros sits at 11-11-2. Deciding which side this season bends toward starts tonight in Cedar Park. Houston returns many players from their Calder Cup Finals roster, including starting netminder Matt Hackett. In one game so far this season, Hackett has one win with one goal allowed against the Wolves in their only game last Sunday. Noted Stars killer Jon DiSalvatore returns to captain the squad again along with former Star Warren Peters, pugulist Carson McMillan and current scoring leader for the team Casey Wellman. One piece that did not return for Houston is the coaching staff, which was promoted to Minnesota this summer. Houston is being led by John Torchetti this year. The Stars will look to extend their success on the power play, which has been a notable difference between the NHL and AHL clubs in the early season. Texas has gone 4 for 8 on the power play while Dallas is at 2 for 19. Can coach Pyle continue his winning ways on the power play? His previous team led the ECHL in PP% for 6 of his 9 season in the Coast, for the record. Meanwhile, Morin Watch 2011 is on. Travis Morin, who has been with the Stars for all three seasons, is on the verge of becoming their all-time leading scorer. With his assist in Sunday's game, he tied Greg Rallo for all-time points at 98 total. With either a goal or an assist, he will surpass Rallo to become the team's leading scorer. Rallo still holds the goal-scoring lead all-time with 45. Morin is not far behind with 42, however. Look for Scott Glennie and Tomas Vincour to join the lineup tonight and hopefully add even more scoring punch. I would be interested in how easy it will be for Tomas Vincour to adjust to Texas's system, as he will be the first transfer between the two teams this regular season. The word from Dallas and Texas was that it should be easier for the players to translate their systems knowledge from one team to the other. Tonight will show that on the ice for the first time. Scott Glennie has been assigned to the Texas Stars by the Dallas Stars this afternoon. Glennie was on the injured reserve in Dallas with concussion-like symptoms after training camp and did not play in any regular season games for the Stars. Glennie already in Cedar Park and has been since Texas's training camp started. The young forward joins a team that is becoming rather full at the forward position with the assignment of Tomas Vincour and the possible recovery of Mathieu Tousignant. For now, an assignment would probably not be expected. The Idaho Steelheads are still in training camp and Tousignant was the team's only scratch on Sunday, meaning that the two new players would mean 3 scratches, one for injury and two for roster limits. That is not really out of the realm of possibility. Forward Tomas Vincour was assigned to the Texas Stars today from Dallas after playing in the team's first three regular season games. Vincour was assigned more as a cap move than as a result of his play on the ice. With Sean Avery coming off the books for Dallas (more info here), Dallas needed salary to get to the cap floor. So, they traded for forward Eric Nystrom from the Minnesota Wild. To maintain their 23-man roster limit, they had to assign someone and Vincour was that casualty. What does that mean for the Texas roster? It really depends on what the plan is for getting Vincour back into the mix. When Glennie and Tousignant get healthy though and Vincour is still here, you have to assign someone to make sure they continue developing somewhere, even if it isn't Texas. Likely options for that would be guys signed to AHL contracts, not NHL contracts. Among those are Stephen Schultz and Mike Hedden. The Dallas Stars announced on Wednesday that the club has assigned forward Tomas Vincour (pronounced Vin-Sore) to the Texas Stars, Dallas’ primary affiliate in the American Hockey League (AHL). Tomas Vincour, a 6-2, 204-pound forward from Brno, Czech Republic, has appeared in 27 NHL games in his career with Dallas, collecting two points (1 goal, 1 assist). 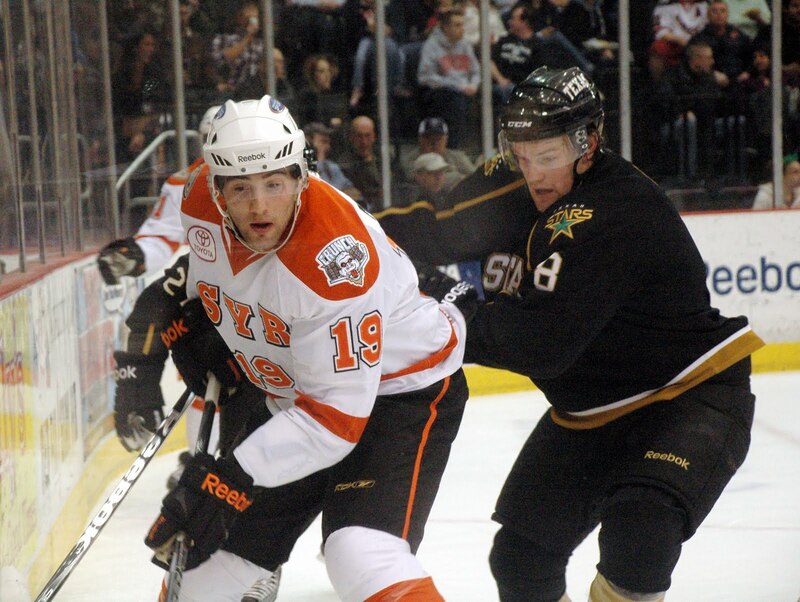 As a rookie in 2010-11, the 20-year old split time between the Texas Stars and the Dallas Stars. In 24 games with Dallas, he scored one goal and set up another. In 44 games with Texas, the right wing scored five goals and totaled 12 points. Dallas drafted Vincour in the fifth round (#129 overall) of the 2009 NHL Entry Draft. For the Texas Stars (1-0-0-0, 2 pts, #4 Western), it was a great opening weekend. With only one game on the schedule in the first week of the season, this week's Texas Stars Report will be predictably shorter than usual. The Texas Stars made a dominate effort and put on a clinic for 60 minutes this afternoon in Cedar Park against the Oklahoma City Barons. The Stars scored early and often, getting what would eventually be the game-winning goal just 67 seconds into the match. "They played phenomenally," said Coach Pyle. "They played hard for 60 minutes and didn't change their game." Richard Bachman picked up his first shutout of the season in his first attempt, stopping all 21 shots he faced. Rookies Matt Fraser and Brenden Dillon each picked up three points in the game. The first Stars goal came off the stick of Maxime Fortunus, who blasted it from the right wing point for a 1-0 lead at the 1:07 mark. Texas followed that up with several power play goals as the Barons made a conga line to the sin bin. At one point, the Barons had three different players in the box with minors, giving Texas an extended 5-on-3. They took advantage. Matt Fraser popped in his first professional goal from the right wing side low to make it 2-0, and Jordie Benn collected an unassisted tally on the power play just 15 seconds later for the 3-0 lead. "You always think about that first one as a forward and it's nice to get it out of the way," said Fraser after the game. Fraser would add another goal in the seconds period to make it 4-0 and chase starter Yann Danis from the net. David LeNeveu would take over. The Stars were relentless on the forecheck throughout the game, getting OKC to turnover the puck constantly. At one point in the first period, the shots on goal sat at a 15-1 advantage for Texas. "We've got a pretty quick team and if we feel like we can get in on the forecheck and make plays before their defenseman get to the puck, we like our chances," added Fraser. Bachman, despite not seeing a lot of shots in the first, played well when called upon in the second and third, as the Barons saw some power play time. "Bachman played great in net as well, making saves when we needed them," said Pyle. Texas poured on a few more in the latter half of the game with Dan Spang and Luke Gazdic picking up power play goals and Tyler Arnason collecting an even-strength tally. Stephen Schultz picked up his first professional point on the play. In all, twelve skaters had points on the night. Dillon ended the night at plus-3 while Fortunus and Wathier came in just behind at plus-2. Texas now looks ahead to Houston coming to town on Friday. Despite the score, Coach Pyle still feels like there are things to work on, "You can't break your arms patting each other on the back. I still have a lot of work to do, but it's a good group to do that work with. It's just good to be a part of it." Luke Gazdic played well tonight, collecting a goal but also getting goaded into a fight. "I think he got forced into the fight," said Coach Pyle. "He wears his heart on his sleeve and has a lot of passion for the game." Hockey returns to the Cedar Park Center for a third season as the Texas Stars open up the 2011-12 season with a home matchup against the Oklahoma City Barons. This afternoon's matchup is the first game for both teams. For the Barons, there has been much upheaval from last season to this one. After making the playoffs in their first season, crossing over to the North Division to face and lose to the Hamilton Bulldogs, the Barons are a new-look squad. The men in the pipes are the first big difference. Last year, Martin Gerber, Jeff Drouin-Deslauriers and Bryan Pitton all took starts for OKC. This year's opening roster contains none of those players; instead former NHL backups David LeNeveu and Yann Denis will protect the net for the Barons. Some of those feared scorers from last year's team are also gone. Alexandre Giroux is now in the Blue Jackets organization and Colin McDonald accepted a deal with the Penguins org. Liam Reddox and Brad Moran both departed for Europe while Jeff Petry and Linus Omark moved on to the Oilers squad in Alberta. The only remaining top 6 scorer from last year's club is Teemu Hartikainen, who split time with the Oilers last year and will likely do the same again this season. Back on defense is veteran Bryan Helmer, who held out on signing anywhere last year before committing to the Barons mid-season. Helmer, who has been up and down between the AHL and NHL since 1993, will be a calming veteran presence among a young and new locker room. Last season, the Stars held a 6-3-0-1 record against the Barons and look to continue the trend this season. Among the Stars' leading scorers in games against the Barons, both Greg Rallo (3-3-6 in 9 GP) and Aaron Gagnon (2-3-5 in 8 GP) have departed. However, Colton Sceviour (3-2-5 in 8 GP) remains and Texas hopes that newcomers, such as Matt Fraser and Tyler Arnason can pick up that slack. As the season starts, you’ve heard a lot of the same things from the Texas Stars coaches and GM in this preason. Strong defense and goaltending will be the core of this team, and they will score by committee. These points were repeated ad infinitum in other press sources. Stars GM Scott White was asked what two or three things he would put on his wishlist if he could for the team. The manager only had one: “an elite AHL scorer”. We’ve talked about that before in this space. A player like an Alexandre Giroux, Jason Krog, or Darren Haydar that can score seventy points is a fantastic addition to the club. I’ve previously posited that budget might be a restriction on this wish list item. Krog, for example, made $550,000 last year in the AHL. Eric Godard snuck onto the Stars’s roster from Dallas. This opens up room for more playing time for Luke Gazdic. Dallas wants Gazdic to play 15-16 minutes a night, fight less and become more of a third line player instead of fourth line. He is in his third year of professional hockey and is a restricted free agent after this year. Putting up points has to be a great way to prove that value to the NHL GM. Tryout player Billy Sauer is the Texas Stars’ top choice for a 3rd goalie, according to Scott White. Coach Pyle was the second person on the ice on the first day of practice. All reports indicate he’s like a kid in a candy store in terms of excitement level for the season. Brad Lukowich talked at length about Jordie Benn’s development. He sees him as a leader for this season and is extremely proud of him for getting a contract with Dallas. Lukowich had a unique experience of being the veteran voice in PEI camp as well for the Dallas Stars since he’s had two years with Coach Gulutzan’s systems. He called out the players’ excitement to learn the systems as one of the big points. Colton Sceviour is looking to continue his role as an energy line player. Personally, I feel like he has a little bit more of a scoring touch than he gives himself credit for, after increasing his scoring totals by 10 points from his rookie to sophomore season in Texas. The Dallas Stars begin the regular season this evening in Big D with a game against the Blackhawks at 7:30 PM. The game is going to be broadcast on FOX Sports Southwest in the Austin area. Tomorrow’s game against the Blackhawks at Chicago will not be broadcast in Austin unless you have Center Ice. All of the question marks are gone on the Stars' roster as the team released their opening day line-up for the start of the AHL season tomorrow. While Texas does not play until Sunday, ten teams are in action tomorrow and even more on Saturday. The mantra in Dallas has been to be "hard to play against" and the roster in Cedar Park seems to have taken after that as well. Between Garbutt, Gazdic, Godard, Sawada and Wathier, there is a player on every line who will take the body, mix it up in the corners and make room for the other Texas players on the ice. This squad, in terms of composition, reminds me of the Boston Bruins from last year. The team may not have a 50 goal scorer, in all likelihood, but that won't matter because the scoring will be by committee. I wouldn't say there are any surprises on the roster, precisely. Tomas Vincour may never play another game in Cedar Park after making Dallas out of camp. Philip Larsen is more likely to be assigned at some point this season with two defensemen out of the lineup in Dallas at this moment. However, he can do his level best to make that decision difficult for Coach Gulutzan and GM Joe Nieuwendyk by playing his best on Friday and Saturday night, if called upon. Tyler Arnason was one of those tryout guys who came up big. The veteran of 487 NHL games could be a major scoring threat in the league, but it remains to be seen and I won't make any huge predictions. If nothing else, he is a strong veteran presence for the forwards. Players previously on the roster who are not on the opening day roster include forwards Rob Bordson and Spencer Edwards and defenseman Andrew Randazzo. Edwards and Randazzo are expected in Allen as camp begins on the 10th. It is unknown as to Bordson's future plans. I am still working on compiling together some of the great quotes I got from yesterday's media day with several players, Coach Pyle and GM Scott White. In the meantime, I wanted to debut yet another new "trivia" page for Texas Stars fans. In the right side banner for the site, you can see several pages listed included attendance records, a listing of all music played at the CPC over the years, records for stars of the game and historical jersey numbers. If you have more music for the music page, by the way, let me know. The most recent addition is Maroon 5's "Moves Like Jagger". Today, I am adding a new page: "Where Are They Now?" The WATN page will attempt to track the current playing status of all of the former Texas Stars across the globe. It may not be updated as frequently as the others, but will serve as a way to keep track of the players of the past. Please let me know of corrections or additions to this page. Either Coyle or Labrie will step into that 6th man role with the other getting the press box. Andrew Randazzo does have a contract with Allen, but the stocky blueliner (5'9, 220 lbs) is a strong possibility to stick around for now and could even sneak into the lineup. Texas Stars Report: Welcoming Hockey Back to Central Texas! The Texas Stars (0-0-0-0, -- pts, #-- Western) opened training camp last week and will see their first regular season game coming this weekend against the Oklahoma City Barons (Edmonton Oilers). For Texas and the AHL, it has been a dynamic offseason. I'll go over some of the changes, preview each position briefly and talk about this past weekend's preseason contests. Taking over for the newly minted Dallas Stars coach Glen Gulutzan is Jeff Pyle, formerly of the ECHL's Gwinnett Gladiators. Pyle brings a strong track record of winning and a knack for special teams, especially the power play, to Texas. Joining him behind the bench to replace Paul Jerrard is Jeff Truitt, formerly of the San Antonio Rampage. Among those, Edwards and Randazzo are signed with Allen and will likely be assigned there if they do not stick in Texas. Bordson played with Syracuse and Adirondack last year, so I should think he could find an AHL job elsewhere if not in Texas. In my mind, Arnason is the one wild card. He is apparently unsigned elsewhere and is a veteran of 487 NHL games. He will definitely count as a veteran. Dallas made their second to last cuts yesterday, getting the roster down to 25 from 32. Official opening day rosters are finalized on Wendesday afternoon, so GM Joe Nieuwendyk and Coach Gulutzan have a few more days to evaluate which players they will cut to get down to the required 23. Those assigned today included goalie Richard Bachman, defenseman Maxime Fortunus, and forwards Eric Godard, Travis Morin, Ray Sawada, Colton Sceviour and Francis Wathier. Godard is a player that we have not discussed to this point in any major capacity. He is a physical fourth line type player who was signed to a two year deal. The first year is two-way and the second is one-way. Godard cleared waivers on the first day possible but was not assigned at that time. The two players expected to come down to Texas still left in Dallas are Philip Larsen and Tomas Vincour. Note that Scott Glennie is also still in Dallas but will be assigned as soon as he is cleared to play after suffered concussion like symptoms in the preseason. Eric Godard's assignment could shake things up for the roster. We'll discuss that a bit more as we get closer to the opener. The Houston Aeros came in to the Cedar Park Center and knocked the Stars down to 0-1-1-1 in the preseason tonight with a 3-2 shootout loss. Tyler Arnason and Dan Spang scored for Texas, who saw Houston's expected starting goalie in the regular season, Matt Hackett for all 65 minutes and the shootout. Regarding the Stars' preseason record, "Everyone is working on systems," said Spang. "I think we've gotten a little better each game." Brenden Dillon added to that, ""I think as a team we should feel really confident going into the year." The scoring opened up early in the game with Dan Spang finding twine on a power play. Spang was excited about the team's success on the power play so far, "It's just a little different setup. We're trying to feel it out." Jace Coyle and Mike Hedden had assists on the play, but the lead wouldn't hold for long. Joel Broda tied things up four a half minutes later. Former Star Warren Peters gave the Aeros a lead with just over a minute left in the period. With Ryan Garbutt in the box for a check to the head, Peter's PP tally was a redirected point shot that beat Beskorowany. Texas tied it up with a goal from Tyler Arnason in the 2nd period. The goal was a nice snipe from the top of the circles to beat Hackett glove side high. That tie would hold over through to overtime. Along the way, several fights cropped up as the play remained chippy through the second and third. The game wound its way to overtime with Billy Sauer replacing Tyler Beskorowany in the third period. Beskorowany stopped 17 of 19 shot and Sauer had 11 saves on 11 shots through OT. In the shootout, it was Jarrod Palmer putting the dagger in Texas with his goal to beat Sauer in the shootout 3 shots to two. All of the shootout goals scored against Sauer were tallied when the Aeros got him moving side to side. It is a definite point that he will need to improve on to stick at the AHL level. He had a solid preseason overall, however, stopping 54 of 57 (.947 SV%) in 4 periods of action. Now Texas looks to integrate some of the new roster players sent down from Dallas today as well as determine which tryout players, if any, will stick with the club for the regular season. "We need to get everything to be second nature so that when we're in a live game, everyone knows where to go and what to do," said Spang. "We've got a lot of guys that just came down today and they're going to get a lot of systems stuff thrown at them." There are too many variables here to keep track of all of the scratches, injuries and call-ups. I will resume this section in the regular season. Brad Lukowich wore the "C" tonight, and Jordie Benn and Luke Gazdic wore "A"s.
The Houston Aeros come to town for the Stars' final preseason game this afternoon in Cedar Park. Of course, these Houston Aeros are not the same as the Western Conference champions of last year, given that it is preseason. We'll save talk of bad blood and those rivalries for the regular season when players that actually played in the games last year will be in the lineups. Coach Pyle was not available for comment after yesterday's game, so there is no early indication as to what sort of lineup he will be icing for today's game. Mark Stepneski has been consistently reporting that Dallas will send down players today now that the preseason is completed for the NHL club. It is unlikely that those players would be inserted into Texas' lineup this afternoon though regardless of when they are assigned. After icing a more veteran heavy lineup on Friday and icing a more tryout heavy group on Saturday, chances are the team will want another look at some of those players who did not play in either game or those who perhaps stood out. A few players to keep an eye on that have played in both games are Ned Lukacevic (41), Rob Bordson (33) and Mike Berube (2). Lukacevic has also been playing point on the power play. Berube was a solid partner for Jace Coyle in both games he has played. The D pairing of Steve Kaunisto and Andrew Randazzo impressed me yesterday as well. Keep an eye out for those players tonight. Texas dropped to 0-2 on the preseason with their last game coming tomorrow as the Rampage completed a come-fromt-behind OT victory today at the Northwoods Ice Center. Goaltender Billy Sauer stopped 43 of 46 for Texas in the losing effort. The Stars will play their final preseason game on Sunday against Houston. The Stars skated to a scoreless tie in the first period. After three goals in the first period last night, Texas had to be happy with the pacey but ultimately even frame. Scoring opened up in the second as the game got a bit chippier as well. The Stars struck first, breaking the tie with a power play goal from Jace Coyle on the point. Coyle's shot was screened all the way and had a clear line to twine. Assists on the play went to Rob Bordson and Matt Case. The Rampage evened it up just under two minutes later with a goal from Garrett Wilson. San Antonio just had a clear and strong breakout and struck with velocity in the Stars zone to tally their first of the night. Coach Jeff Truitt mentors a player on the Stars' bench. With former Star Greg Rallo in the box for interference, Texas jumped out to a lead to end the period. Former Gwinnett Gladiator Patrick Galivan buried a one-timer from the left wing circle to go ahead 2-1 with help from Chad Klassen and Andrew Randazzo. Texas played through a mostly scoreless, but very shot-heavy, third until San Antonio pulled goalie Andrew Volkening for the extra attacker. Greg Rallo twisted the knife by scoring the game tying goal with 43.9 seconds left in regulation. Assists to Tyson Strachan and David Marshall. The Stars would go to overtime and fall 3-2 to the Rampage on a goal from Cullen at 2:44 of the OT. Assists on the that goal went to Strachan and Thomas. Billy Sauer had a solid third period but didn't get the win. After the second period, San Antonio had 18 shots and finished the game with 46, meaning the Rampage bombed Sauer with 28 shots in 22:44 of action. It was a solid outing but he just didn't get the W.
Mike Hedden wore the "C" tonight, and Matt Tassone and Mike Berube wore "A"s.
As per usual, a slightly shorter preview since Texas only just played the Rampage last night. The Stars will travel to the Northwoods Ice Center, San Antonio's practice facility, to player their second of three preseason games. Tomorrow's game should have more tryout guys in the lineup than veterans. Pyle and White are trying to determine which of the tryout players should get call-ups later in the year. "There will be a lot of younger guys in the second game, a lot of guys who didn't play today," said Pyle. "A lot of the guys that are veterans, that were here last year, won't be in that game, so it gives us a chance to look at a lot of the young guys." 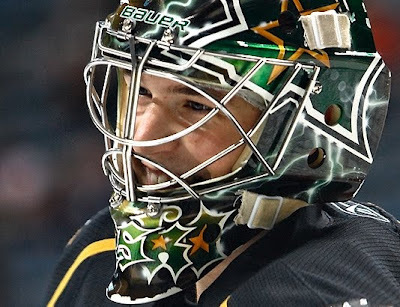 Keeping in mind that the Dallas Stars system does not have a fifth goaltender in place, Billy Sauer, who will likely play in Idaho this year, might get some time in net to evaluate his potential as that fifth option. As a reminder for anyone travelling to the game, admission is $5 and the Rampage "Fan Fest" will be going on at Northwoods starting at 1:00 PM.